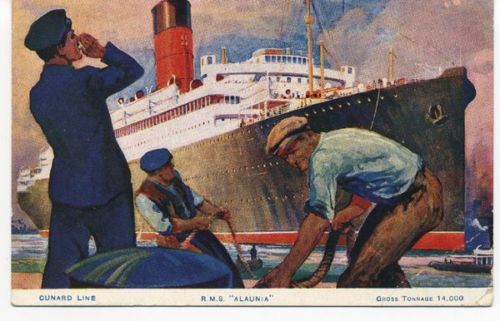 Painting of RMS Alaunia, the artist is Charles E. Turner. 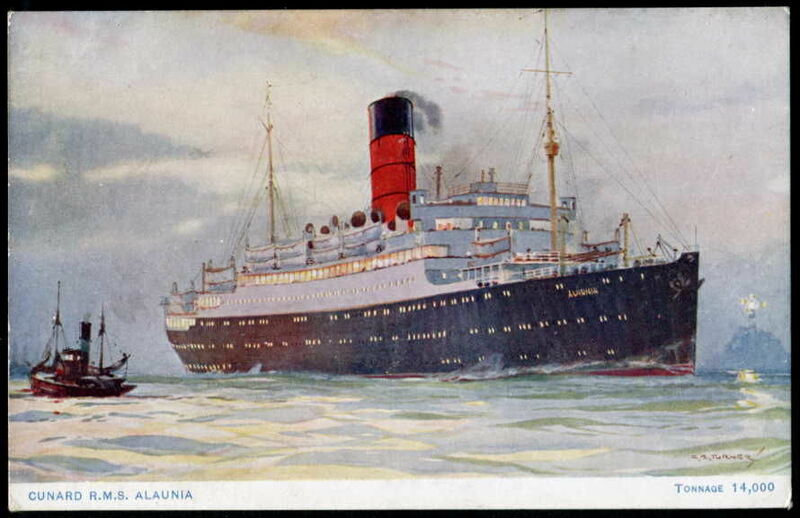 Painting of RMS Alaunia by unknown artist. 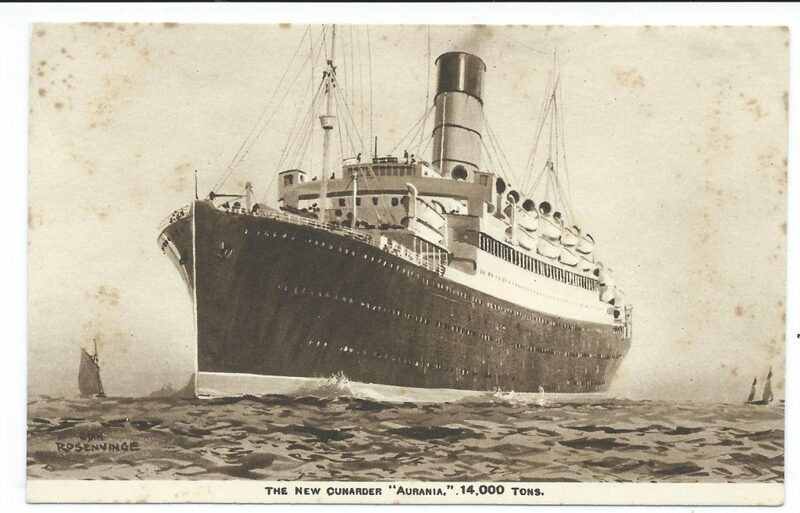 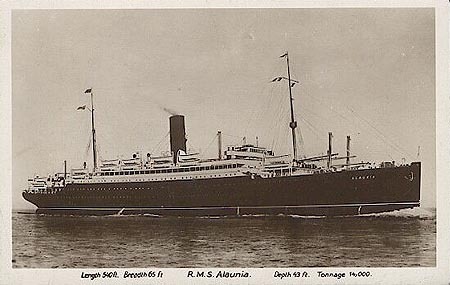 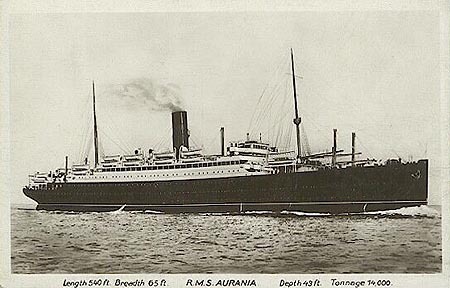 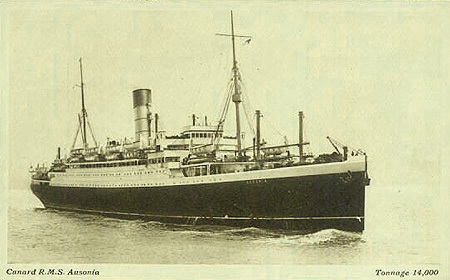 Cunard publicity photograph of RMS Alaunia taken in the early 1920’s by an unknown photographer. 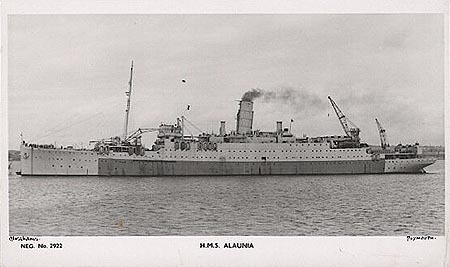 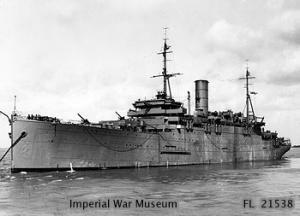 Royal Navy publicity photograph of HMS Alaunia taken in the 1940’s by an unknown photographer. 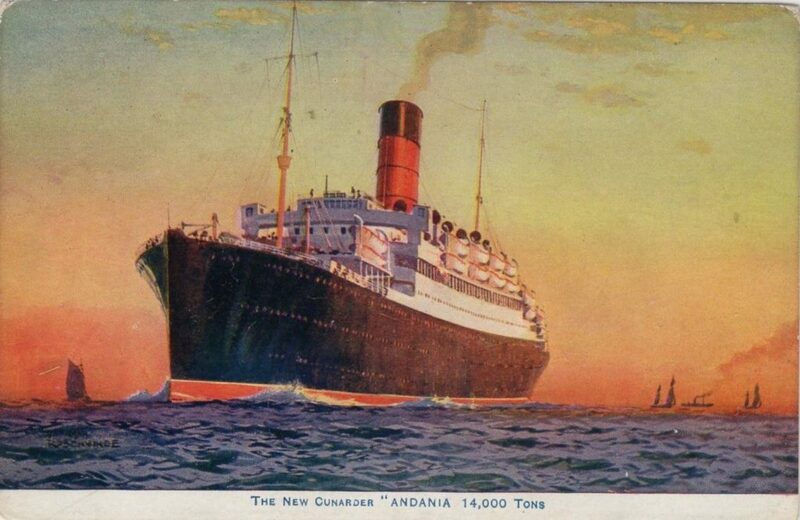 Painting of RMS Andania, the artist is Odin Rosenvinge. 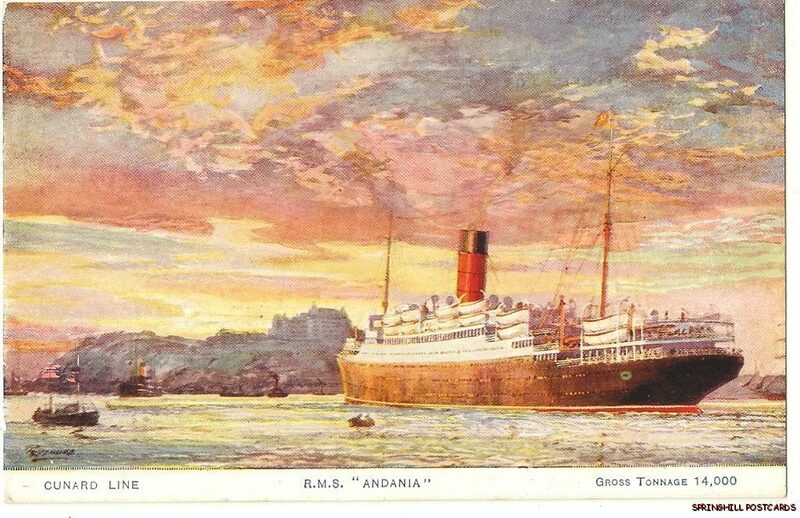 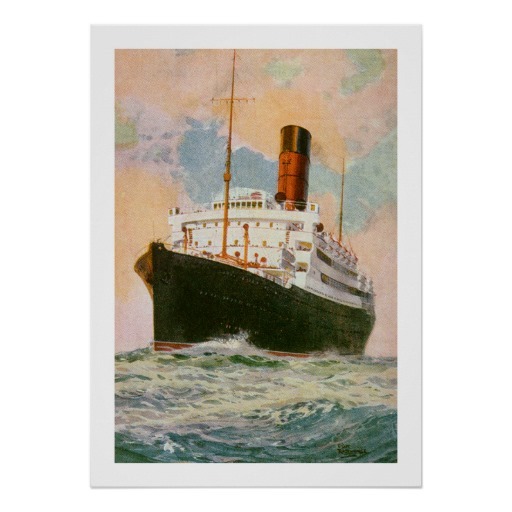 Painting of RMS Andania by unknown artist. 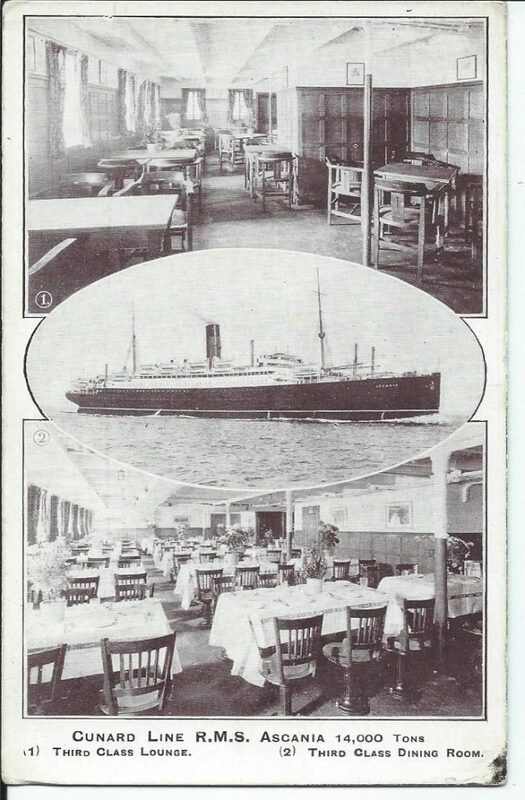 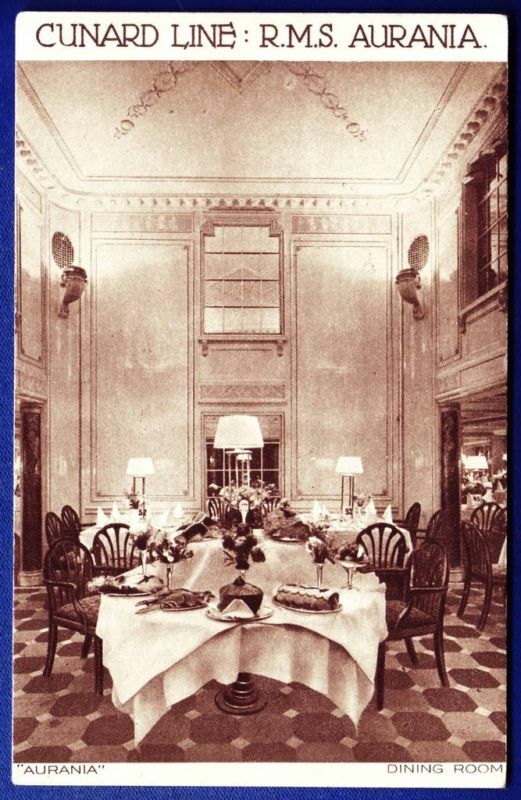 Painting of the 3rd Class Public Room, Dinning Room, Social Hall and 4 berth cabin onboard RMS Andania, by unknown artist. 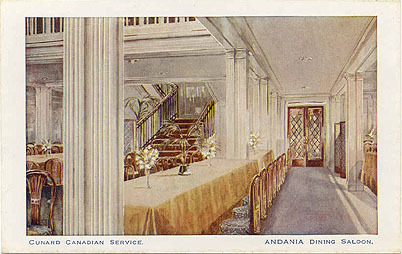 Painting of the dinning saloon on RMS Andania by unknown artist. 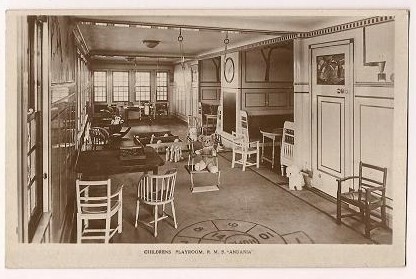 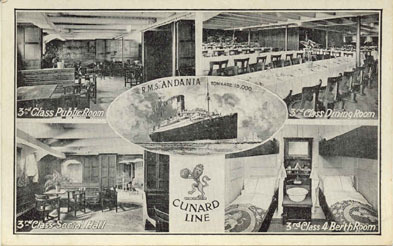 Cunard publicity photograph of the Children’s Playroom onboard RMS Andania taken in the early 1920’s by an unknown photographer. 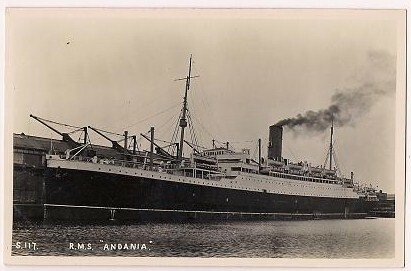 Cunard publicity photograph of RMS Andania taken in the early 1920’s by an unknown photographer. 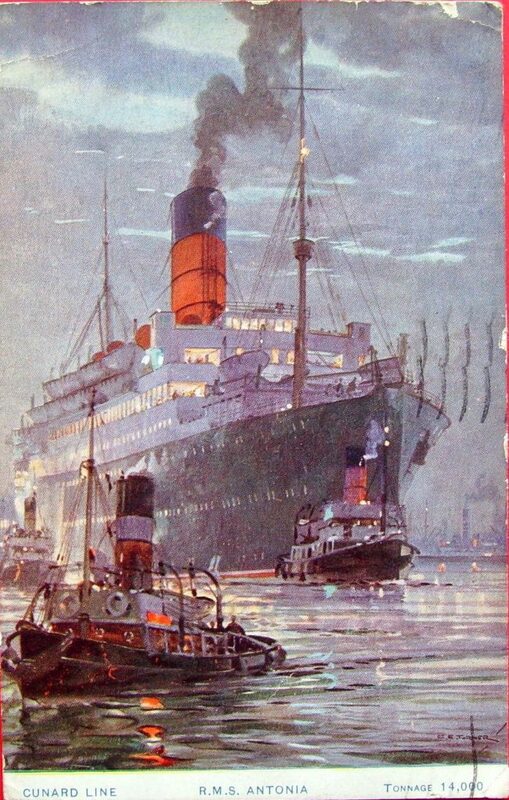 Painting of RMS Andania by Kenneth Smoesmithy. 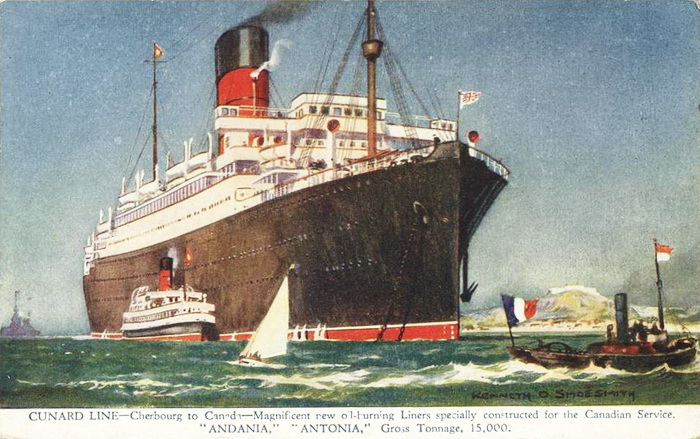 Painting of RMS Antonia, the artist is Charles E. Turner. 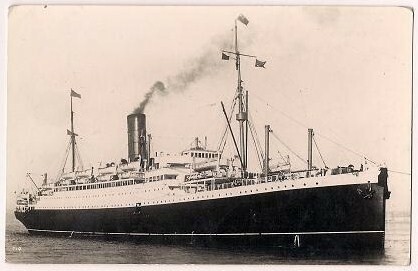 Royal Navy publicity photograph of HMS Wayland taken in the 1940’s by an unknown photographer. 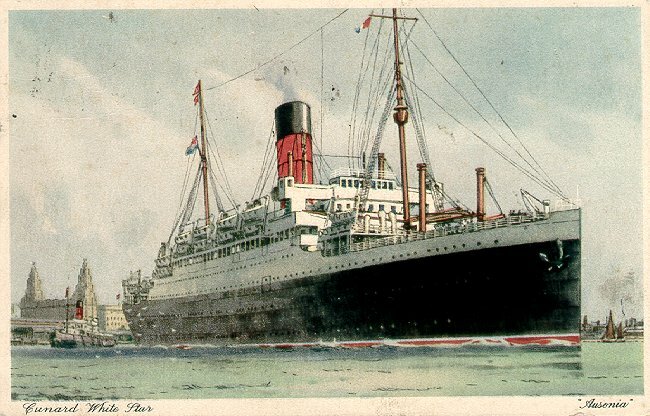 Painting of RMS Antonia, by unknown artist. 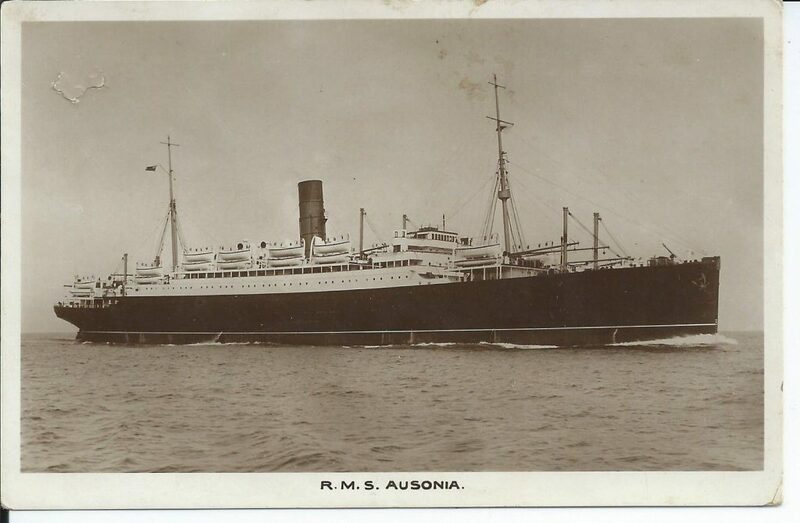 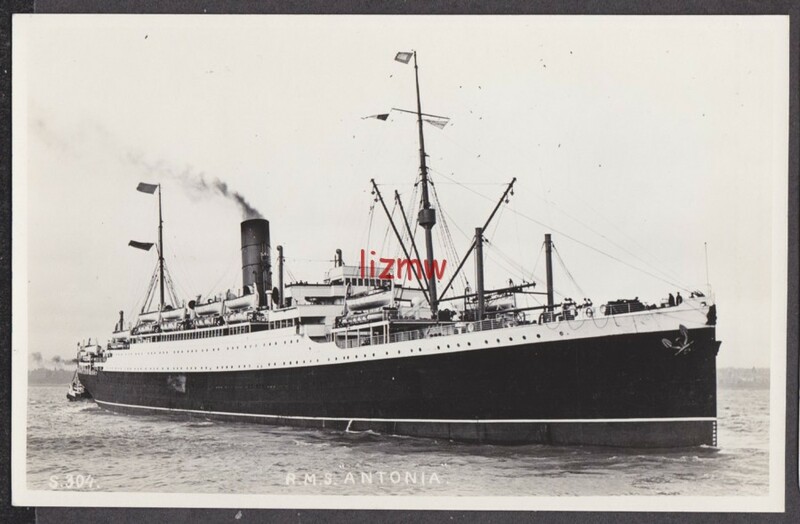 Cunard publicity photograph of RMS Antonia taken in the early 1920’s by an unknown photographer. 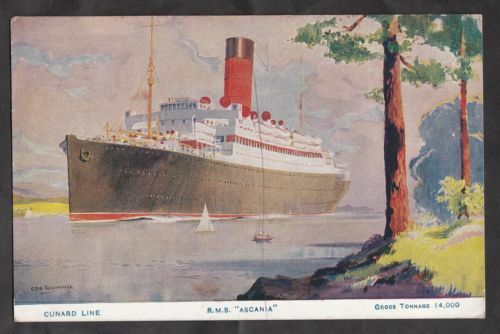 Painting of RMS Ascania, the artist is Odin Rosenvinge. 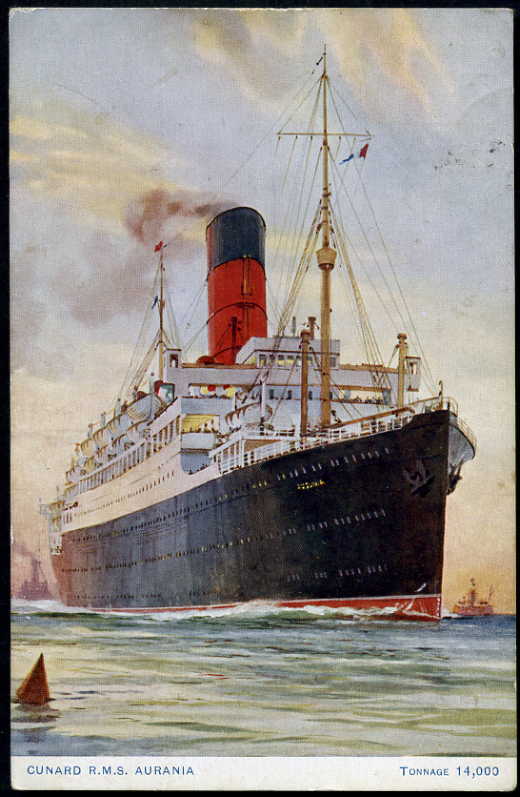 Painting of the 3rd Class Lounge and Dinning Room onboard RMS Ascania, by unknown artist. 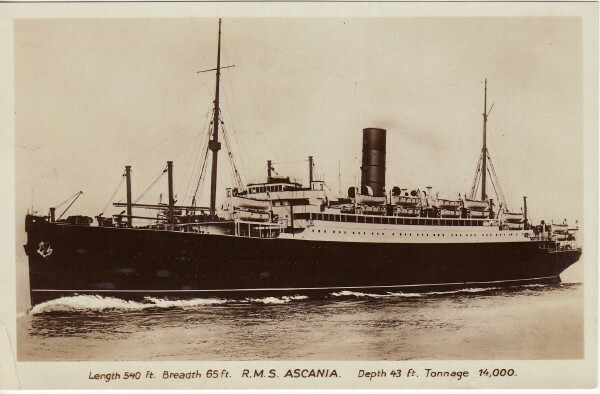 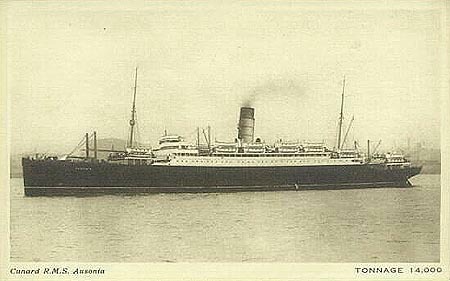 Cunard publicity photograph of RMS Ascania taken in the early 1920’s by an unknown photographer. 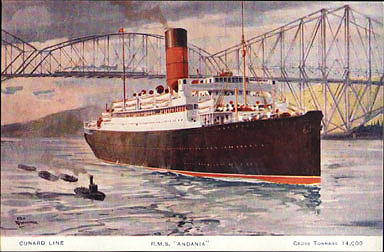 Painting of RMS Aurania, the artist is Charles E. Turner. 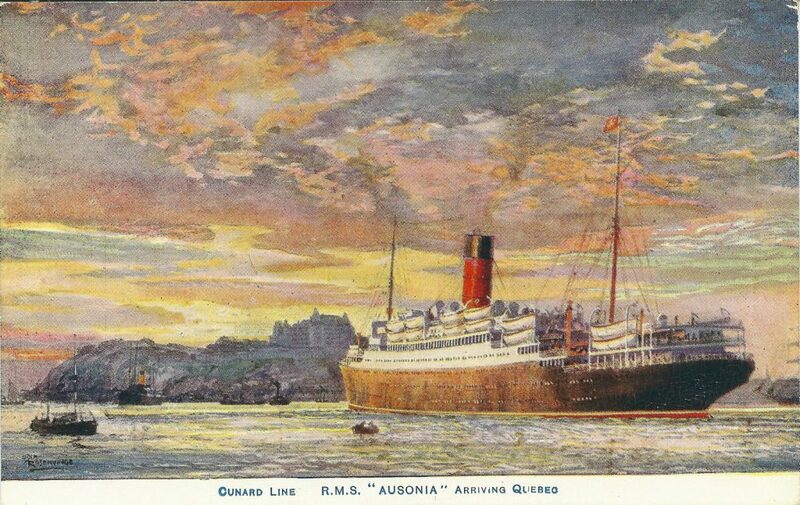 Painting of RMS Aurania, the artist is Odin Rosenvinge. 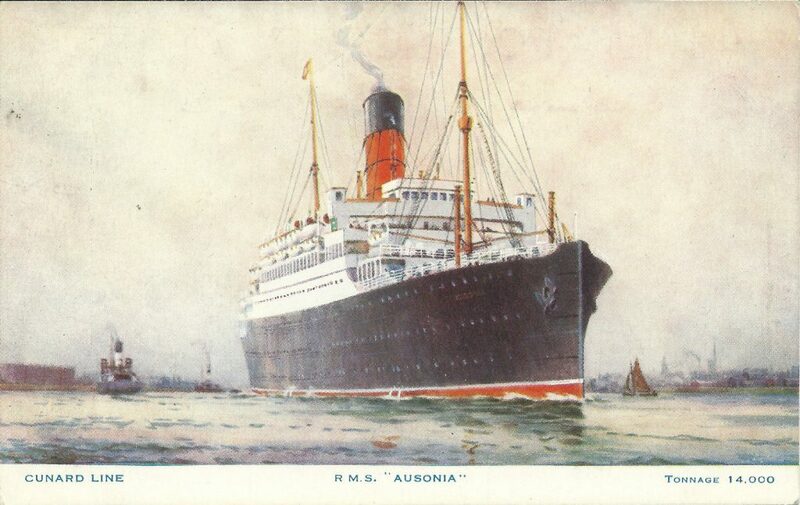 Painting of RMS Aurania by unknown artist. 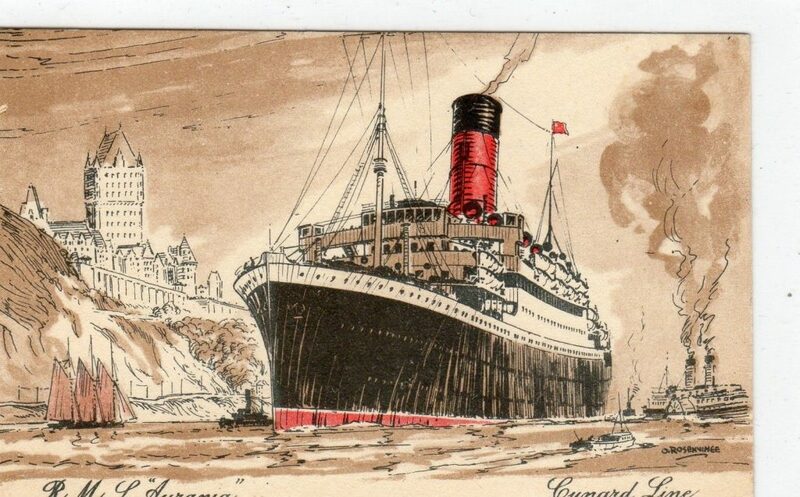 Painting of the Smoking Room onboard RMS Aurania by unknown artist. 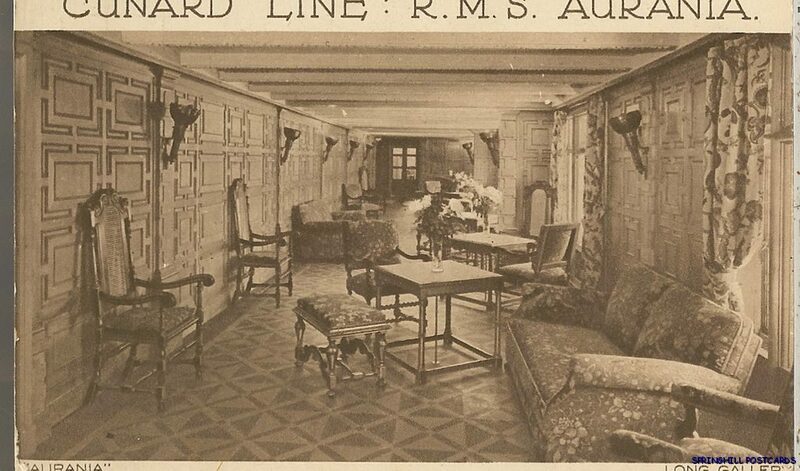 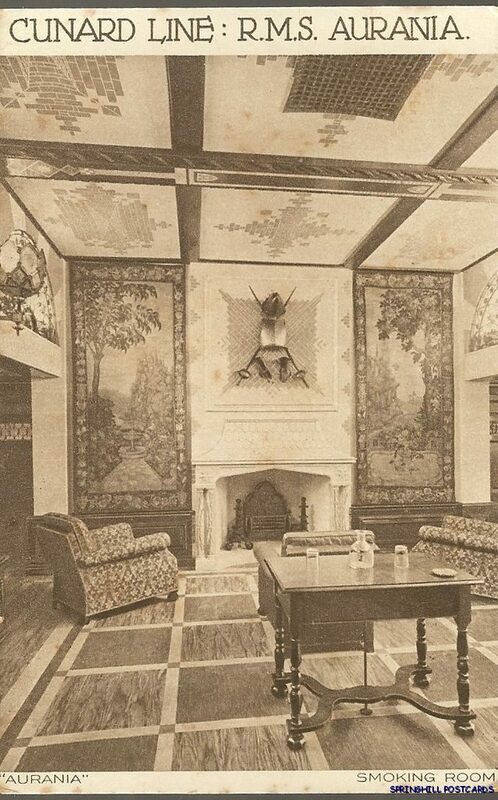 Painting of the Dinning Room onboard RMS Aurania by unknown artist. 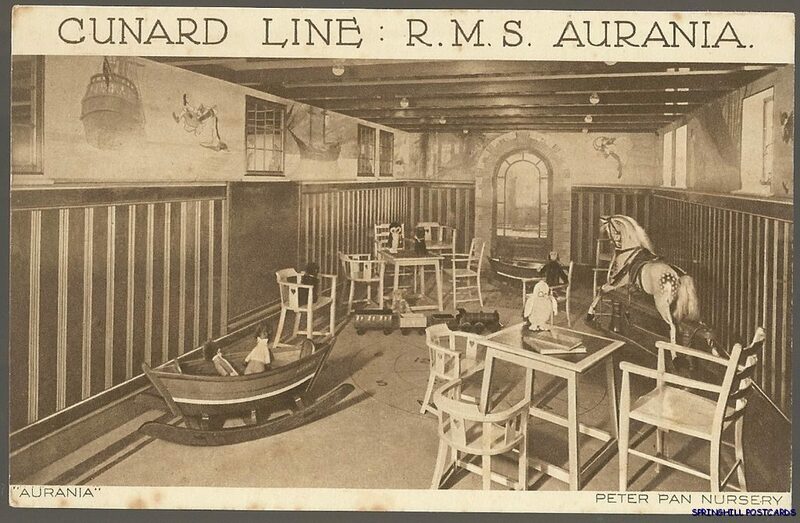 Painting of the Peter Pan Nursery onboard RMS Aurania by unknown artist. 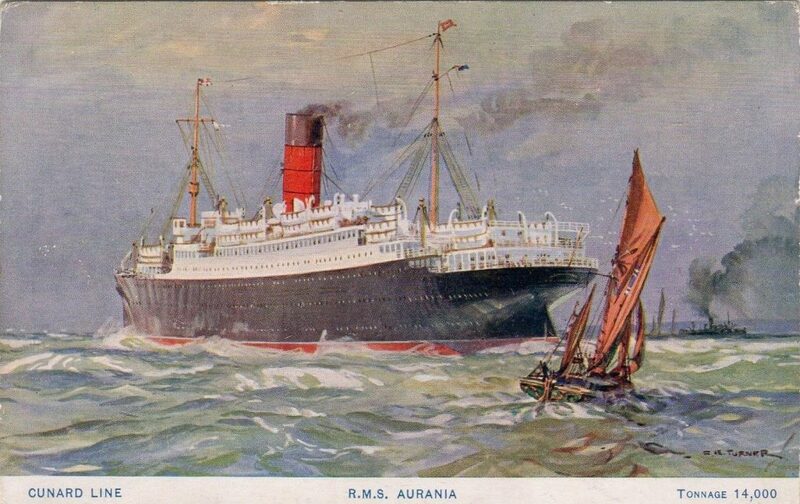 Painting of the Long Gallery onboard RMS Aurania by unknown artist. 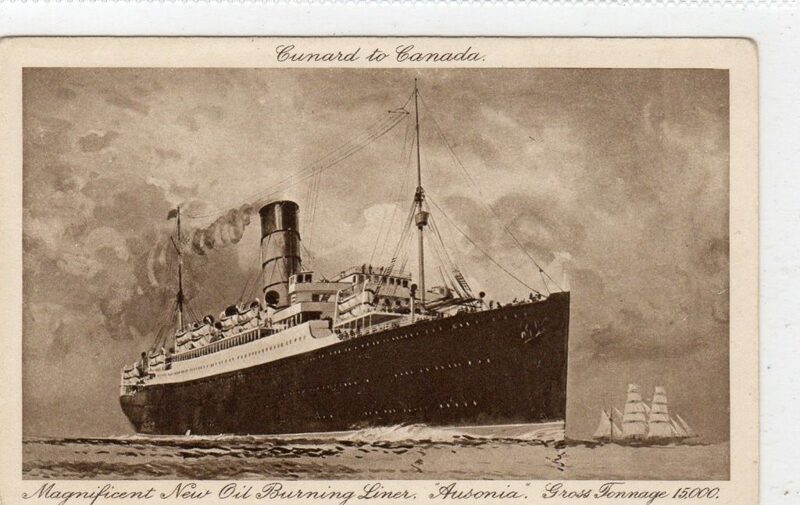 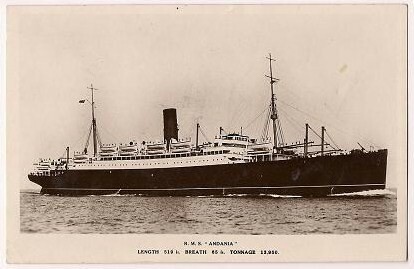 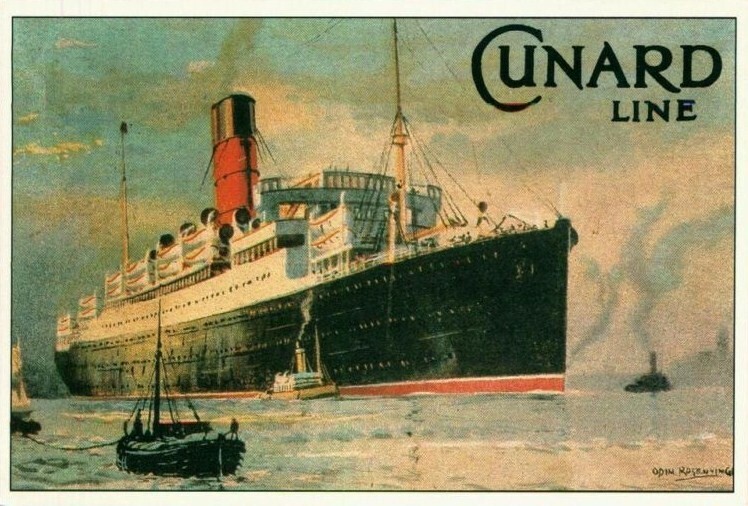 Cunard publicity photograph of RMS Aurania taken in the early 1920’s by an unknown photographer. Painting of RMS Ausonia, the artist is Odin Rosenvinge. 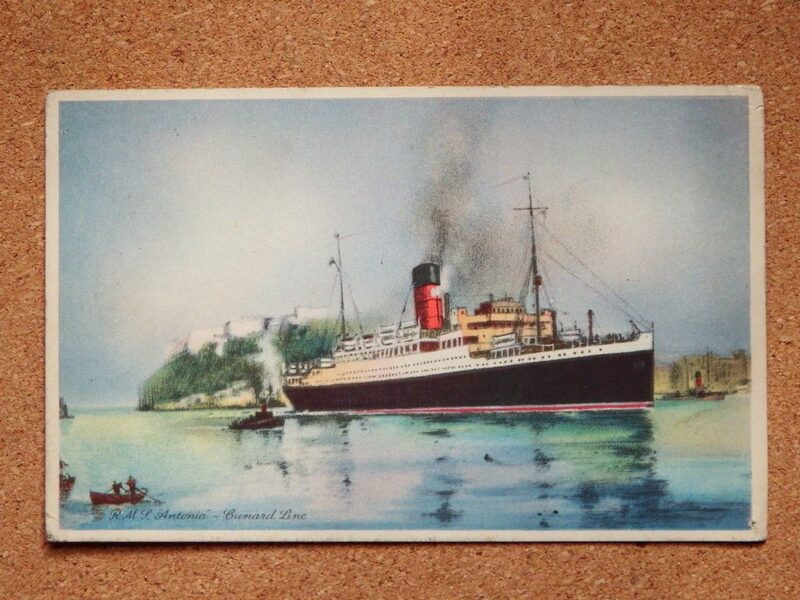 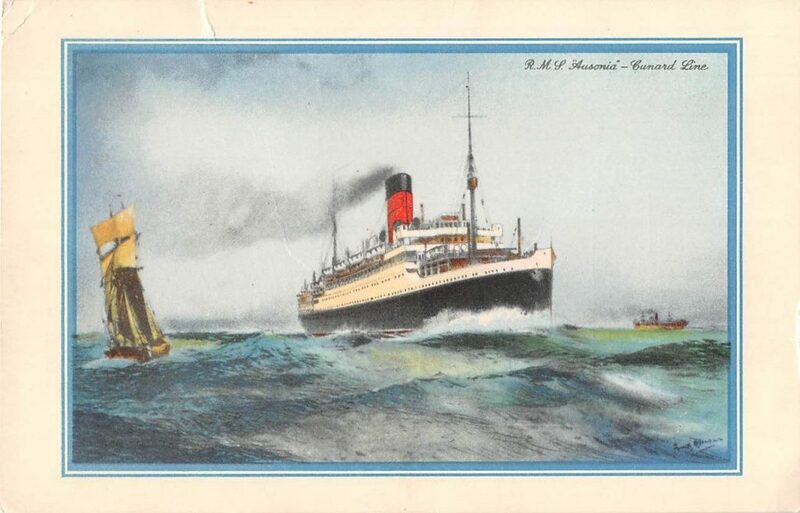 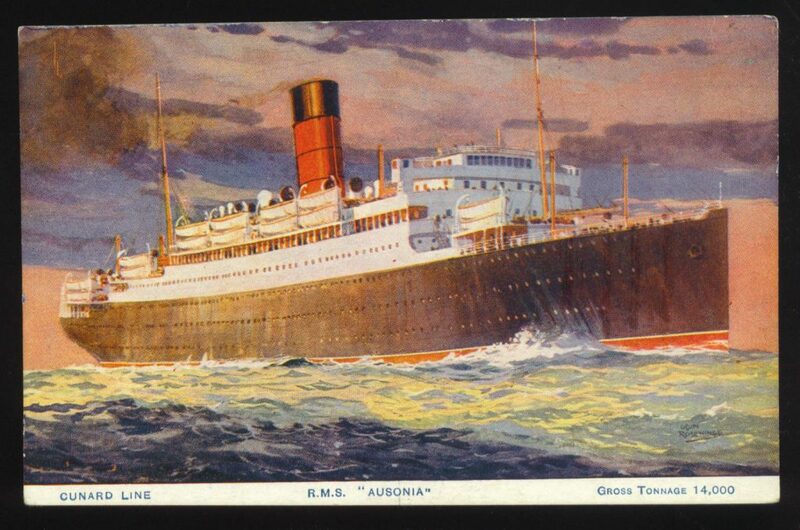 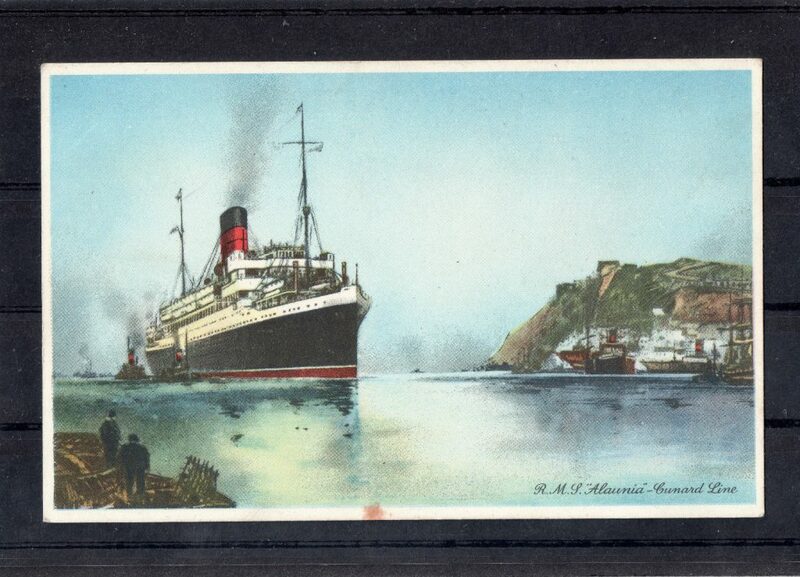 Painting of RMS Ausonia, the artist is Frank Mason. 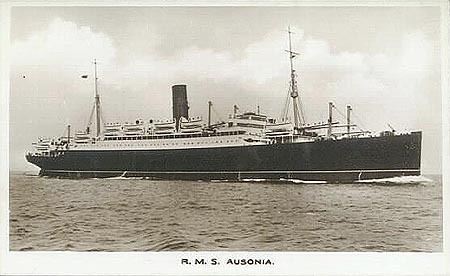 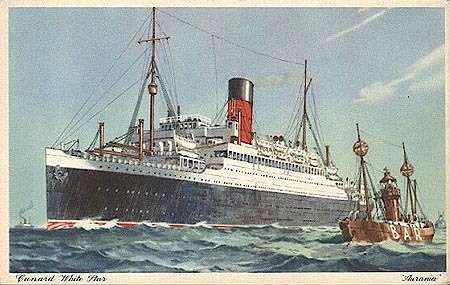 Painting of RMS Ausonia by unknown artist. 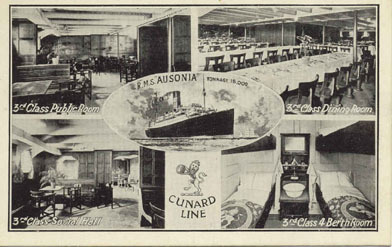 Painting of the 3rd Class Public Room, Dinning Room, Sound Hall and 4 berth cabin onboard RMS Ausonia, by unknown artist. 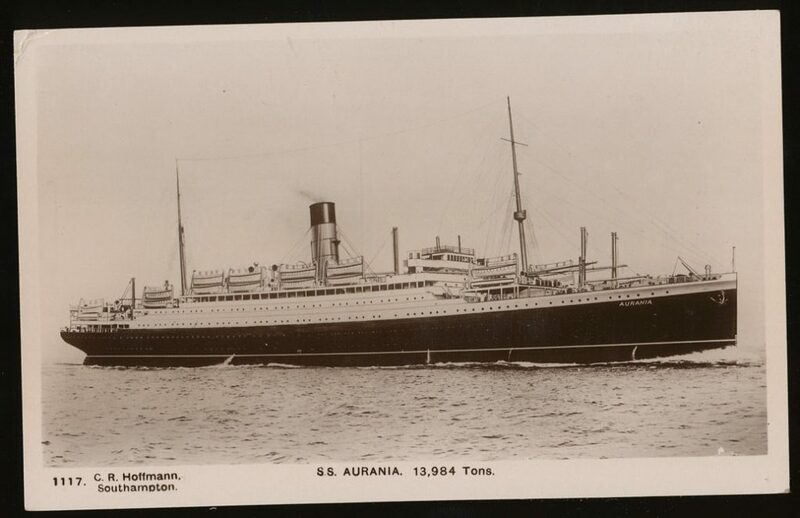 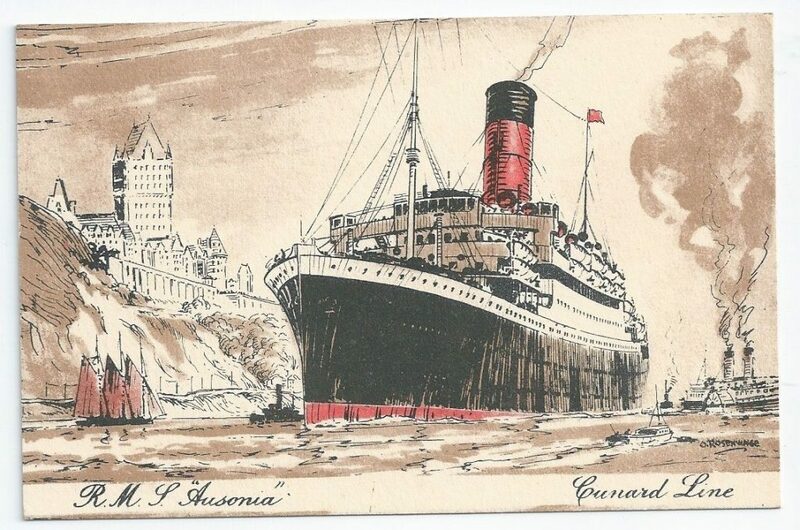 Cunard publicity photograph of RMS Ausonia taken in the early 1920’s by an unknown photographer.